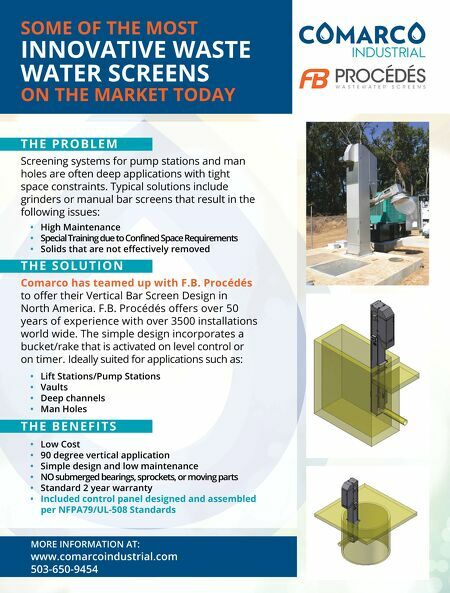 Water Innovations gives Water and Wastewater Engineers and end-users a venue to find project solutions and source valuable product information. We aim to educate the engineering and operations community on important issues and trends. Attacking Sanitary Sewer Overflows California municipalities write the book on solving sanitary sewer overflows by sharing best practices and technology tips. By Billy Wright A Tale Of Two Cities Two California cities dramatically reduced the occurrence of sanitary sewer overflows (SSOs) through enhanced technology and business process improvement. The effort included evaluating operations to establish a performance baseline, implementing multiple best business practices/strategies, and using technology to manage the data. A host of best business practices was used that ranged from streamlining workflows to utilizing advanced technology. For example, a complete computerized maintenance management system (CMMS) with geographical information system (GIS) connectivity and closed circuit television (CCTV) data was used to enhance routine schedules, track work, and improve operations. This transformation led to improvements in the efficiency and effectiveness of operations, with increased quality as a direct result of routine cleaning, improved work reporting practices, application of good business tools, and integration and automation of work processes. These efforts and related implementations produced the desired effects of SSO reductions in both agencies. Behind SSO SSO is a condition in which untreated sewage is discharged into the environment prior to reaching sewage treatment facilities. It can be the result of a wastewater sewer system either having an overflow, spill, release, discharge, or diversion of untreated or partially treated wastewater. Some of the factors that can create these issues include infiltration or inflow of excessive stormwater into sewer lines during heavy rainfall, rupture or blockage of sewerage lines, malfunction of pumping station lifts or electrical power failure, and human operator error at treatment plant facilities. The U.S. EPA estimates the magnitude of the problem to be about 40,000 SSO events occurring in the U.S. each year 1 . The volume of untreated sewage discharged to the environment is less than 0.01 percent of all treated sewage in the U.S.; the total volume amounts to several billion gallons per annum and accounts for thousands of cases of gastrointestinal illness each year 2 . Numerous municipalities and special districts that manage wastewater systems must face the seemingly insurmountable challenge of adhering to court-mandated consent decree orders or agreements made by environmental groups and regulatory agencies against responsible entities who manage wastewater systems. These efforts include operational performance, environmental stewardship, and regulator y reporting requirements, or else they incur hefty penalties for this pollution and non-compliance. Shrinking budgets may be unavoidable, and other methods must be used in lieu of increased staffing in order to optimize resources and accomplish organizational goals while still meeting all regulatory requirements. The risk of not meeting these requirements not only endangers the public and the environment but also results in large fiscal impacts as a consequence of fines or fees. Improved By Necessity The sewer networks for each city range in size from 87 to 105 miles of gravity sewer and have approximately 13,000 and 11,000 service connections respectively. Each agency operates and maintains six lift stations and produces an average of 3.5 million to 4 million gallons of wastewater per day. 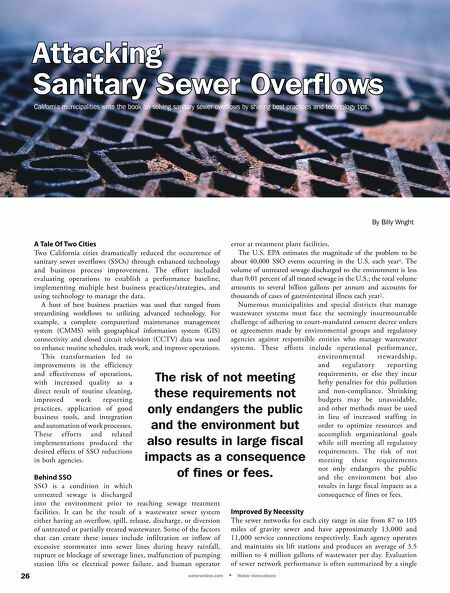 Evaluation of sewer network performance is often summarized by a single 26 wateronline.com n Water Innovations The risk of not meeting these requirements not only endangers the public and the environment but also results in large fiscal impacts as a consequence of fines or fees.